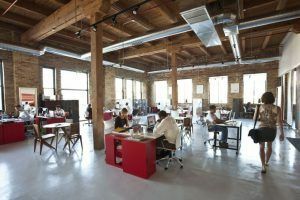 What's In a Coworking Space? What’s In a Coworking Space? Recently, the SoMe Team had the opportunity to declare a new HQ: the coworking space Enerspace Chicago. Situated in the West Loop, Enerspace Chicago boasts “workspace + wellness” for its tenants. Floor to ceiling windows, exposed brick and fiery red and orange décor give this place a tangible energy conducive to idea hashing and collaboration. This isn’t the first coworking space Chicago has to offer. Most notably is the Merchandise Mart’s 1871, which officially opened May 2, 2012, and includes 50,000 square feet of space, a business acceleration program (a program usually financed by venture capitalists to accelerate company growth on a national or global scale), and a coding and design school. In addition to 1871, you can also find The COOP, Onward Coworking, Catapult Chicago, and a host of other shared workspaces in the city. So next time you’re feeling restricted by your cube, visit your local coworking space. You may find the friendly and open environment gets your juices flowing!